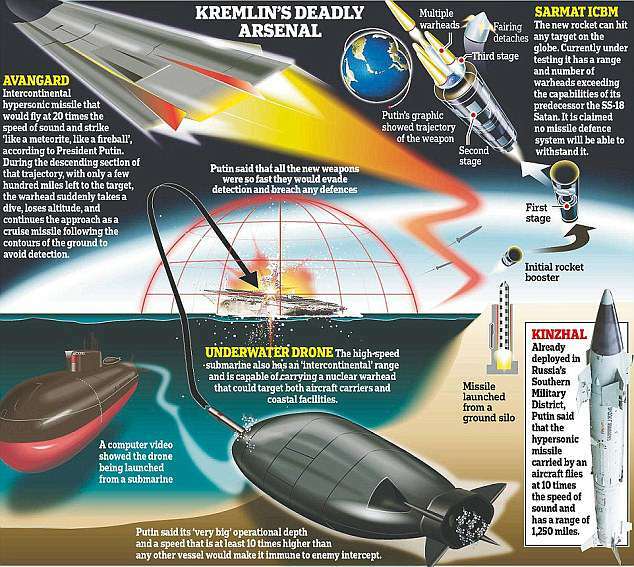 Russia's new nuclear drone submarine could be capable of causing 300ft-high tsunamis, able to wipe out coastal cities, experts say. 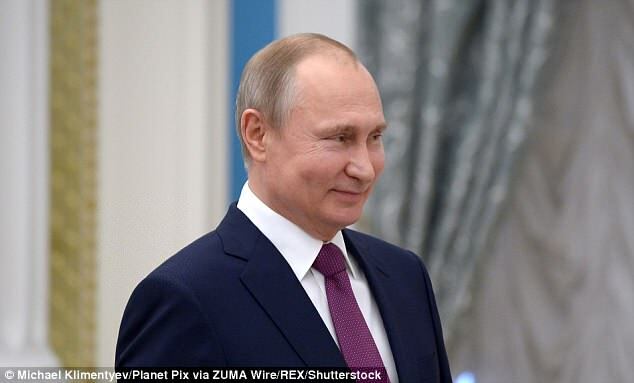 The existence of the drone, believed to be the Status-6 system - also known as 'Putin's doomsday machine' - was confirmed by the Russian President himself in his annual state-of-the-nation speech in Moscow last month. 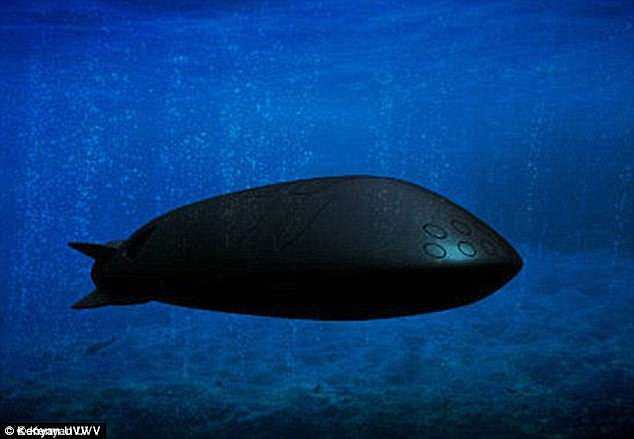 Experts say a 50 megaton underwater nuclear bomb would be able to create tsunami waves reaching more than 320ft - the 'Status-6' is allegedly able to carry a 100 megaton warhead. 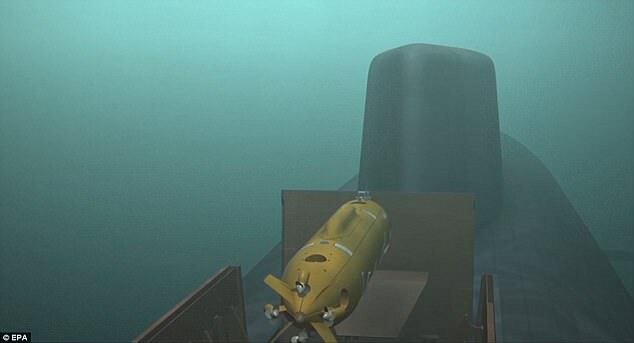 In his speech on March 1, Putin said the high-speed underwater drone also has an 'intercontinental' range and is capable of carrying a nuclear warhead that could target both aircraft carriers and coastal facilities. Physicist and nuclear-weapons researcher Rex Richardson told Business Insider that an underwater warhead dropped by the drone could destroy coastal cities. 'A well-placed nuclear weapon of yield in the range 20 megatons to 50 megatons near a seacoast could certainly couple enough energy to equal the 2011 tsunami [In Japan which killed nearly 16,000 people], and perhaps much more. Mr Richardson added that such an underwater nuclear bomb dropped off the coast of the United States would be able to cause catastrophic damage to cities such as Los Angeles or San Diego through radioactive fallout rains. The 'Status-6' was one of several new nuclear weapons which President Putin announced as having undergone tests in recent months. In the state-of-the-nation speech, Putin said the arsenal include a nuclear-powered cruise missile, a new hypersonic missile and showed video footage the launch of a new heavy intercontinental ballistic missile on big screens. Speaking of the new arsenal, Putin said that the nuclear-powered cruise missile tested last fall has an unlimited range and high speed and maneuverability allowing it to pierce any missile defense.